SCVHistory.com LW3407 | Placerita Canyon | John Wayne in 'The Trail Beyond,' Lone Star 1934, Publicity Photo (Rare). John Wayne in "The Trail Beyond"
Rare original publicity photo from a 1934 Paul Malvern-Lone Star Western ("The Trail Beyond") with John Wayne, filmed at the Trem Carr Pictures Ranch in Placerita Canyon (now part of Disney-Golden Oak Ranch). Lone Star Westerns (circa 1931-1935) are easy to find on DVD because they're out of copyright, but all original publicity materials from Lone Star Westerns are exceedingly rare. BW, 8x10 inches; two staple holes suggest it was used as a lobby card. Noah Beery Jr. is at left (he grew up to play the father of James Garner's character on TV's "The Rockford Files"). John Wayne is at right. The sign on the building in front of Wayne says "Drug Store." The building behind Beery is the general store. We can't read the sign on it. Can you? Robert N. Bradbury directed the Lone Star Westerns, which was Malvern's brand at the time. Bradbury cast either his own son, Robert A. Bradbury (stage name Bob Steele), or Steele's high school buddy, Marion Morrison (Wayne), in the leading role — never in the same movie. 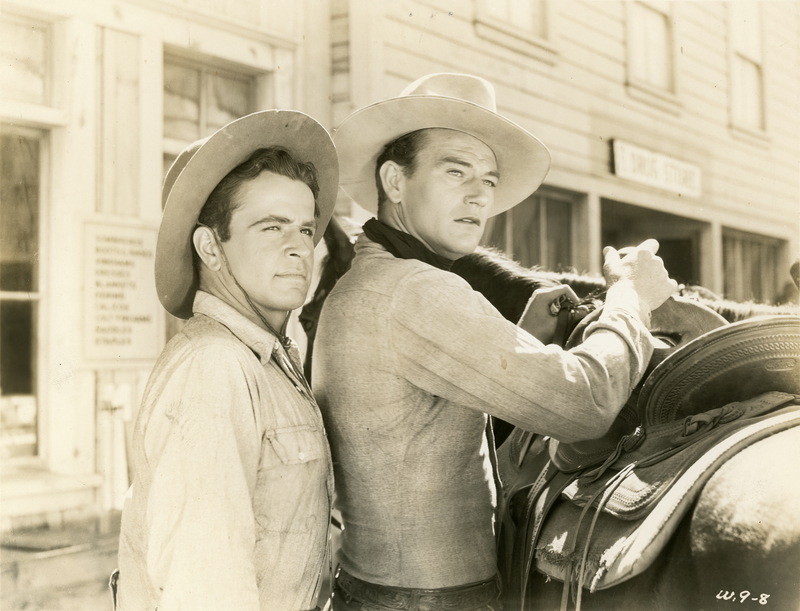 In fact, Wayne and Steele wouldn't appear together until 1953's "Island in the Sky," followed by "Rio Bravo" (1959), "The Comancheros" (1961), "McLintock!" (1963) and "Rio Lobo" (1970), by which time Wayne was a huge franchise and Steele's days had passed. When "The Trail Beyond" was made, Carr was leasing a ranch next to Fat Jones' movie ranch just east of today's 14 Freeway. In 1936, Carr literally picked up sticks — the Western buildings erected by his art director/set decorator/prop man, Ernie Hickson — and trucked them down Placerita Canyon road to property that Hickson purchased. After Hickson died in 1952, Gene Autry bought his property and renamed it Melody Ranch (after his radio show, not the eponymous 1940 film, which wasn't made there). Yakima Canutt performs stunts in our picture, as he did in all Lone Star pictures, without any credit, as usual; Eddie Parker, who also performs stunts, got a screen credit. Cinematographer Archie Stout, who would stay with Malvern for years, is behind the camera. Rounding out the credited cast are Beery's uncle, Noah Beery; and Verna Hillie, Robert Frazer, Iris Lancaster, James A. Marcus and Earl Dwire. Uncredited cast includes Artie Ortego and Tex Palmer. The scenario is written by Lindsley Parsons from a story by James Oliver Curwood ("The Wolf Hunters"). Additional locations include the Chatsworth train station, Devils Postpile National Monument, Mammoth, Big Bear, June Lake, and the General Grant Grove in Kings Canyon National Park. LW3407: 9600 dpi jpeg from original photograph purchased 2018 by Leon Worden.